Can anybody tell me why I get this error? I get an NullPointerException on the following line. cam is null because you never set it to anything. If you run your app in debug mode and mark the offending line (usually left-clicking beside the line number), it will tell you which object is null. Pretty much all IDE’s have this feature. Can you tell me more about setting the camera? but still I get an NullPointerException. If you call anything on it then you will get a NullPointerException. cam = something… where ‘something’ is a camera. Show the modified code and the latest stack trace with the line number. This is pretty basic Java stuff here… hopefully those willing to help out someone just learning Java will step in to help. It’s ok for now the error is fixed. Still getting errors in the rest of the code. I will try to fix it. Thanks for the help. still got an error I can’t fix. this line gives an NullPointerException. Does someone know why I get an NullPointerException? I added this field so this can’t be it. If someone else doesn’t step in to help, you may want to find some Java tutorials online to brush up on your Java skills. 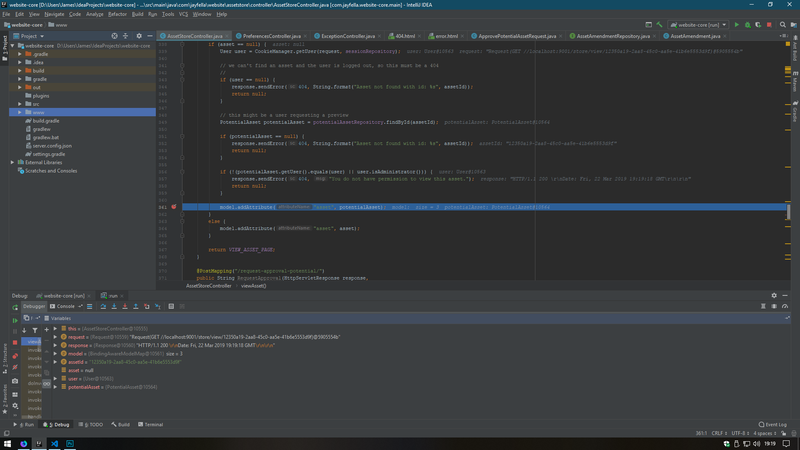 Trying to learn JME and Java at the same time is going to be very hard… and probably pretty discouraging. your nullpointerexception occurs on the line you mentioned, if sunColor was null, it would not throw a nullpointerexception on this line because your not doing anything other than passing the reference. however, either “spatial” or “getMaterial()” must be null and since youre using a control i assume spatial is not null (that is you added that control to a spatial if im not mistaken) which means getMaterial must return null. Since youre on the same line trying to set the color of that returned material you get a nullpointer exception. by the way, when you fixed the problem with the nullpointerexception regarding the camera, why didnt you just remove it? I find the fastest way to find npe’s that aren’t popping out at me is to System.out.println() every possible null value until I find the right one. etc etc for every part of the line that is throwing an exception. Null Pointer Exceptions are going to be very, very common. You’ll need to learn how to spot possible exceptions as you go. Just be sure to erase the println once you’ve found the issue! I would venture to guess that the camera should likely be a reference to the camera already provided by the main app (eg. passed into a constructor for SunControl), unless there is very specific use for a secondary camera just for the sun (like skybox or environment mapping). Also, with height commented out, sunColor will be interpolated by the default 0.0f (squared), so with changeAmnt set to 0, this is virtually clamped to beginColor. Presumably, the height could be set to the ratio of the spatial’s current height (local y) over the maximum height reachable (high noon), with any negative heights clamped to 0. Finally, related to the latest null pointer exception; make certain that the spatial this control is being created for is actually an instance of a Geometry, and that it has a valid Material assigned (with lighting material def, of course), && that it is properly attached to that Geometry. What do I have to do next to fix this? I know it works in the Main class but not in this class.